A World War Two coastal battery appears on aerial photographs taken between 1945 and 1952. Visible features include two gun emplacements, a building and barbed wire obstructions. Sections of the gun emplacements survive on Cley next the Sea beach; these are two large rectangular blocks of concrete with settings of metal pins that would have held the guns in place. November 1987. Visit. On beach between high and low tide marks. Defensive structure? Two extremely thick slabs of concrete, one with circle of iron bolts in centre. Resemble similar objects within edge of Stiffkey Camp. Probably World War Two remains. However, iron poles protruding from sea may indicate some sort of outlet here. This in fact is base of World War Two machine gun mounting. Metal rods protruding through top. Survey No. D1-9. Survey No. 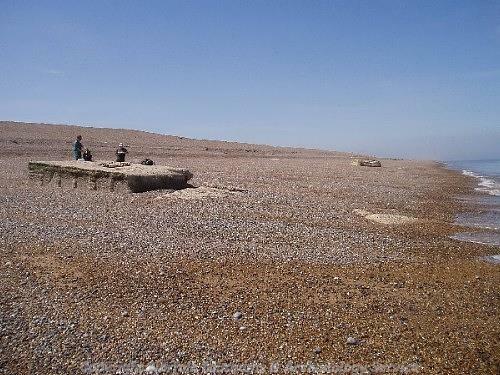 D1-6 described as remains of rare 6 inch emergency coastal defence battery, built 1941. Mounting base rings of two guns are visible. Rest destroyed by sea. Appears to be duplication of Survey No. D1-9 which had wrong grid reference. E. Rose (NAU), 3 December 1997. A World War Two Coastal Battery site is visible on RAF aerial photographs from 1946 (S2) and 1952 (S3). The site is centred on TG 0518 4512 and covers an area approximately 430m long and 125m wide along the coast. To the immediate west is a further area of military buildings and barbed wire obstructions recorded under NHER 27794, which is likely to have formed an extension of the main Battery site. The main area of the site is situated on top of a post-medieval sea bank SMR 27749. Many of the military structures appear to be cut into this bank. A string of linked defences 175m long run from TG 0506 4522 to TG 0522 4516. The western structure at TG 0506 4522 appears to be a tower, possibly a observation post or similar structure, measuring 8m by 5.5m. Two large gun emplacements are visible at TG 0512 4521 and TG 0518 4519, these are visible as semicircular roofed structures, 10m across and positioned on rectangular bases, 8m wide. These would have held 6in guns. These guns are linked either side at the rear to two rectangular structures, approximately 4m by 2m. These may be magazines or some such similar structure. All along this bank there are rectangular structures of this approximate size. They are all connected by a linear system of walls and trenches. A narrow bank also appears to run from TG 0519 4517 to TG 0507 4520. It is hard to tell whether these earthworks are a wartime construction; they may have been on the site already. To the east of the main group there are two slightly larger rectangular structures, located at TG 0522 4516 (8m by 3m) and at TG 0536 4513 (6m by 5m). These may be additional pillboxes or gun positions. The southern/landward side of the battery is defended by three rows of barbed wire which run from TG 0502 4521 in two directions; to TG 0534 4508 and TG 0495 4516. Another three lines of wire were placed in-between TG 0536 4510 to TG 0528 4500 and a possible additional section may run from TG 0535 4507 to TG 0537 4504. To the north of the main strip northern barbed wire section, and within the enclosed area are several pits indicating mines. On the 1952 aerial photographs a dispersed line of indistinct 'dots' running from TG 0512 4520 to TG 0498 4517. It is possible that these represent the former position of mined defence lines. Also to the immediate north of the barbed wire, at TG 0514 4512 to TG 0523 4511, are narrow slit trenches. According to the secondary file the guns were mounted early 1941. This site along with other defences in close vicinity (NHER 27752 and NHER 32462) would have defended this strip of coast, until the battery was closed in January 1944. The site appears to have largely been destroyed in the 1953 floods and subsequent coastal erosion. The observation post was demolished in 1955. S. Massey (NMP), 19 February 2003. Possible additional stretches of barbed wire obstruction, associated with the coastal defence battery, can be seen on RAF aerial photographs from 1945 (S4) and 1946 (S5 to S7). These are located to the east of the main site and run from about NGR TG 0496 4516 and TG 0498 4523 to TG 0487 4525. They stretch between this site and the neighbouring defence site (NHER 27794). There is also an additional building, located at TG0494 4526, to be seen on these 1940s images and on RAF 1952 aerial photographs (S8). It seems possible that this building is also associated with the defence battery in some way. H. Clare (NMP), 19 March 2003. No change, still exposed at low tide. Found by D. Gurney (NLA) at TF 73579 16976 in southwest corner of Transco Plot 252. Scattered pile of bricks of which one example retrieved. Yellow voussoir brick, rough outline; approximately 210mm long, 85mm wide at narrow end, 100mm at wide end, 80mm thick. Probably early 19th century, mould cast then one side rubbed to shape; intended for window arch or bridge. Identified by E. Rose (NLA), 29 March 2003. Context 92. Part of Cley Coastal Battery (World War Two). A large rectangular block of concrete (and five loose fragments) was found at the base of the shingle bank at TG 05198 45213. On its top was a circular setting of solid metal pins the housing for a heavy gun. Context 125. Part of Cley Coastal Battery (World War Two). A large rectangular concrete block was found at TG 05130 45232. On top was a circular setting of iron pins; these would have held a heavy gun in position. <S2> Vertical Aerial Photograph: RAF. 1946. RAF 106G/UK/1701 3046-7 27-AUG-1946 (NMR). <S3> Aerial Photograph: RAF. 1952. RAF 58/844 5034-5 21-MAR-1952 (NMR). <S4> Aerial Photograph: RAF. 1945. RAF 106G/UK/403 3042-3 18-JUN-1945 (NMR). <S5> Aerial Photograph: RAF. 1946. RAF 106G/UK/1701 4071-2 27-AUG-1946 (NMR). <S6> Aerial Photograph: RAF. 1946. RAF 106G/UK/1701 3065 27-AUG-1946 (Norfolk SMR TG04/TG0544/A). <S7> Aerial Photograph: RAF. 1946. RAF 106G/UK/1701 3085-6 27-AUG-1946 (NMR). <S8> Aerial Photograph: RAF. 1952. RAF 58/844 (F14) 5036-7 21-MAR-1952 (NMR).